Last time we made some awesome taste chicken salad and cheese sticks. I recommend this salad so much! 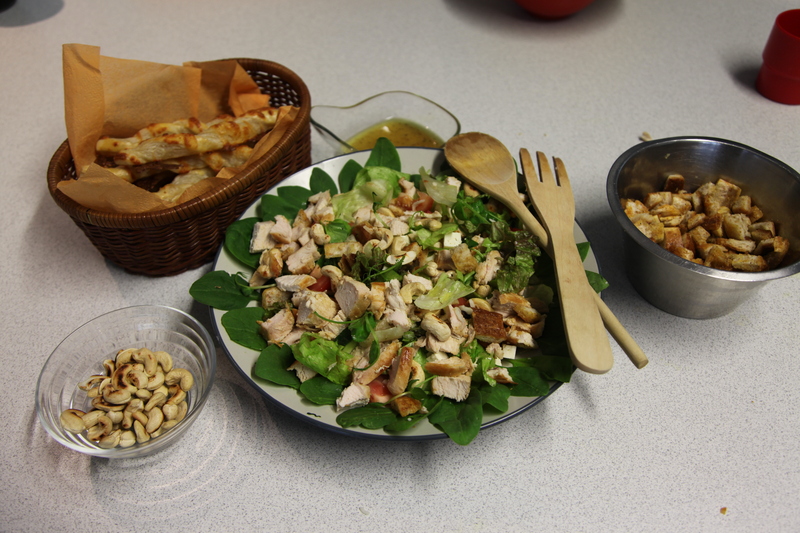 I have to say this that I´m so proud of my group because the salad was so delicious! That´s why I’m here today to writing to you ’cause I want to share this recipe with you guys there. Actually you don’t have to follow this recipe so hard. You can also use some your own tricks if you want! I hope so that you are going to make this and if you do, I will like to hear your feedback for example comment down below. Hope you like this & have fun! Above you can see all the raw material that we used in this salad. Now I´m going to tell step by step how we did this! Remember that before doing nothing you have to wash your hands! 1. Wash your raw materials carefully and then chop them in the way you will like to. Then combine the raw materials in your own chosen plate. 2. Then we are going to fry the chicken and peanuts. Season your chicken in that way you will want to. We used some black pepper and salt. Fry the chicken without using oil until its has a light brown colour! 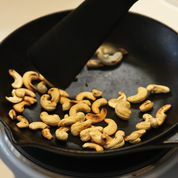 With your peanuts do in the same way but be carefully with the frying because the peanuts get black so easily! 3. This step is optional! So if you want you can make some croutons from the old bread. Slice your bread for little pieces and fry them with oil. If you want you can leave them like that but if you want you can season your bread in our own way! 4. Put all the materials together on one plate and decorate that if you will like to! That was all about the salad! I hope that you like that recipe! Please comment down below what you think about this. Okay, this is the second recipe that we made last time. So we make some cheese sticks, I’m not sure about the name! But actually that doesn’t matter so much 🙂 It was so yummy and hope you are going to make this too! This recipe is so simple so to make this you don’t need much skills! Don’t worry just let go and enjoy the cooking! Here is the step by step recipe for you 🙂 Lets get started! 1. First you have to make your dough. 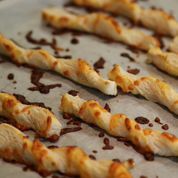 We used already prepared dough but you can also make your own! The dough what we used is called in Finnish voitaikina. I have to translate that word for word because I don’t know the right word but it’s called butter dough. 2. Roll out the dough as long as you got the shape of square. Then cut from the square as many slice as you can get it. 3. Keep the slice from the both ends and twist the slice as long as you got some curves. 4. Cover the slices with some cheese. You don’t have to do this step but they get so good taste from the cheese! I recommend to do this! 5. Put the cheese sticks to the owen and keep them until them get a gold brown cover and the cheese on top of them is melted.